The Friday Memo, written by Northfield City Administrator Joel Walinski and many of the department directors, managers, and supervisors, summarizes many of the staff activities for the week. Although it’s directed to the mayor and city council, it’s helpful for citizens to see what’s going, too. NOTE: There’s City Council meeting on Monday night. See the agenda. Handwritten thank-you notes arriving via the USPS are a rarity these days. So when one shows up, it’s quite a treat. 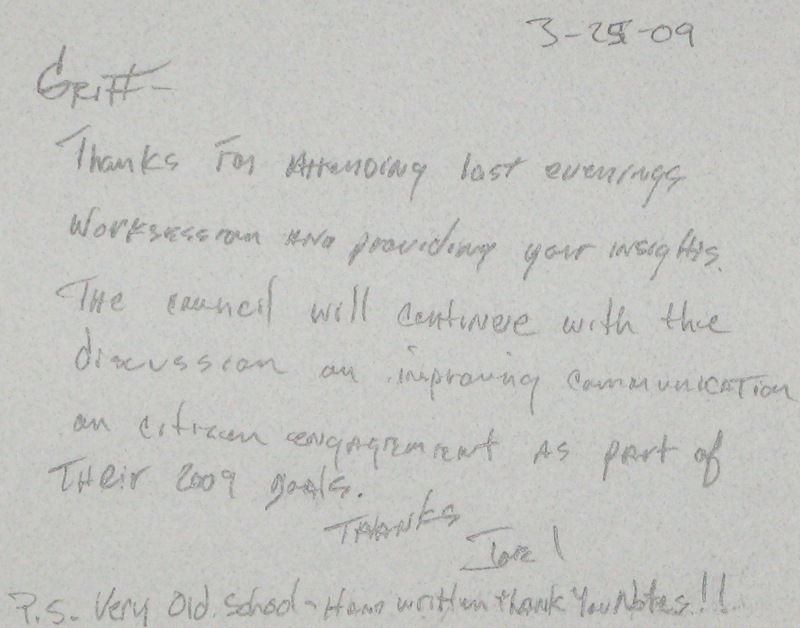 I got this one from Northfield City Administrator Joel Walinski last week, thanking me for speaking to the City Council at their work session. Nice touch, Joel. See this 2006 NPR story titled In Wired World, Handwritten ‘Thank You’ Still Tops. I saw Mayor Mary Rossing about an hour ago as she was opening up her store, Present Perfect, and she informed me that the Northfield City Council voted last night to offer Joel Walinski the job as Northfield City Administrator. Joel’s been ‘interim’ since last summer when Al Roder departed for greener pastures. I guess he’s accepted the offer because the word ‘interim’ has been removed from his web page. Joel was first a guest on our podcast back in Dec. 2007 when he was a lowly city parking lot attendant Director of Public Services. He appeared on our show again in August of 2008 with his interim hat on. Congrats to Joel and to the Council for a good choice. The Friday Memo, written by interim Northfield City Administrator Joel Walinski and many of the department directors, managers, and supervisors, summarizes many of the staff activities for the week. Although it’s directed to the mayor and city council, it’s helpful for citizens to see what’s going, too. The Friday memos are published and archived in PDF form at the bottom of Joel Walinski’s web page. See the Friday memo for this past week and then comment or ask questions about it here. Be sure to check out the included Open Letter to President-Elect Barack Obama on building America’s fiberoptic networks. NOTE: City Hall is closed tomorrow in observance of Martin Luther King, Jr. Day. 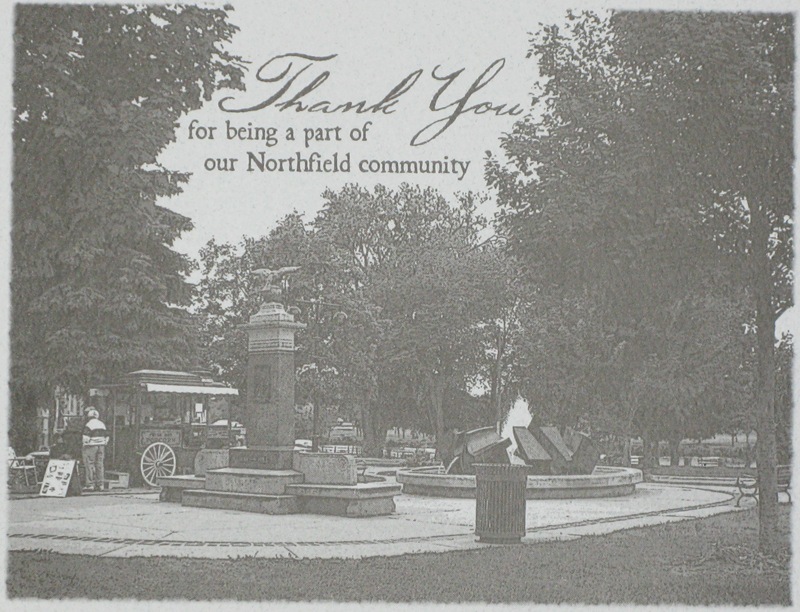 The Friday Memo, written by interim Northfield City Administrator Joel Walinski and many of the department directors, managers, and supervisors, summarizes many of the staff activities for the week.